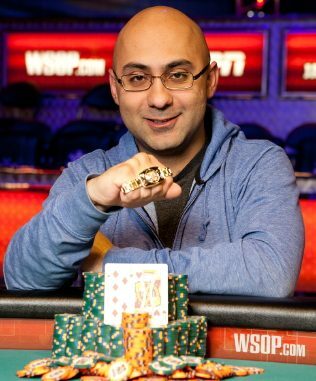 Ashkan Razavi, a 30-year-old professional poker player from Maple Ridge, British Columbia, Canada, is the latest WSOP gold bracelet winner after taking out the $1500 buy-in No Limit Hold’em Re-entry title, for USD $781,398 in prize money. Razavi’s victory was as challenging as it was well deserved. He overcame the largest turnout for a $1500 buy-in event at the WSOP in four years, outlasting a monster-sized field of 3404 entries in what turned out to be a gruelling four-day grind. The payoff came on the last day, when Razavi (pictured left) defeated a formidable final table line-up that included some seasoned veterans as well as hungry newcomers to the WSOP final table scene. One of the most notable finalists was Amanda Musumeci, who continues to solidify her reputation as one of tournament poker’s brightest up-and-coming new stars. Musumeci burst upon the scene in last year’s WSOP Main Event Championship, when she finished 62nd. The Philadelphia poker pro then proved she was no flash in the pan by cashing 10 times on the WSOP Circuit this past season. She collected a memorable consolation prize at this final table: a runner-up finish and a payday amounting to $481,398 in prize money in what many will consider to be another breakthrough advance for the young pro. 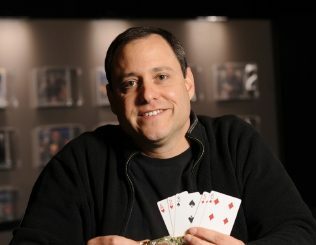 Other notable moments at the final table included two-time gold bracelet winners, who came up far short of would have been their WSOP-victory trifecta. Brian Rast took sixth place while Greg Mueller finished seventh. • Vincent Van Der Fluit just the fourth Dutch-born World Series of Poker gold bracelet winner when he bested a 970-person field in Event #11, the $1500 Pot-Limit Omaha. First prize was USD $265,211. Notables joining eventual champion at the final table included WSOP Circuit champion Charles Tonne, 2011 WSOP Europe Main Event 11th place finisher Alex Dovzhenko and WSOP Europe gold bracelet winner Tristan Wade. After only three and a half hours of final table play, Van Der Fluit faced Tonne heads-up. The pair began their duel almost even in chips, and it appeared as if the lightning-fast pace that characterised play to that point would slow. But in true PLO fashion, the heads-up battle lasted barely 30 minutes. • The field in the $10,000 buy-in Heads-Up No-Limit Hold’em World Championship was slashed from 32 to four. In round 6 (quarter-finals), Brock Parker moved one step closer to winning his third gold bracelet, after wiping out Michael Drummond. Jason Mo took no time to sweep away Andrew Robl and advance to the final four. Meanwhile, Brian Hastings had a tougher battle with Jeffrey Gross, but prevailed. The final player of the foursome will be Tommy Chen, who took out Chris Moore. The winner will collect $371,498 and a WSOP gold bracelet. • There are several other events either underway or kicking-off today. Event #13, the $1500 Limit Hold’em tournament, played from 212 starters down to 25. Leonid Bilokur leads on 318,000 with Ian Johns (258,000) and Chris Swan (256,000) close behind. Event #14, the $1500 No Limit Hold’em Shootout, played from 1138 starters down to 120. The winner will collect $311,174. The line-up of players returning includes Phil Ivey, Joe Cada, Blair Hinkle, Scott Clements, Erik Seidel, Terrence Chan, Gavin Smith, Jeff Madsen and Melanie Weisner. The $5000 buy-in Seven-Card Stud High-Low Split tournament attracted 212 players with 137 returning for day two. First prize is USD $269,037 with Phil Hellmuth topping the chip count after the opening day. 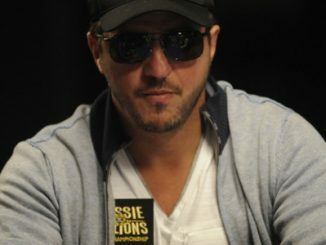 Aussie Poker Hall of Famer Gary Benson is also through to day two. Event #16, the $1500 buy-in Six-Handed No Limit Hold’em tournament starts today.